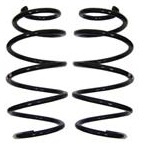 Saab 9-3 Front Spring Pair. Genuine Saab. 2003-2007 Saab 9-3 Sedan (non Aero). Notify us with VIN# if you are not sure these fit your car. Old P/N 93190594.